One of the best ways to locate a roadrunner is to listen for the unique sound they produce by clattering their mandibles together. Roadrunners are unmistakable large birds with long tails, long heavy bills, brown and white streaking on their bodies and a short ragged crest that is often raised. They are very capable runners and chase after their prey. They can fly short distances but usually only do this to escape from predators. Nests are built by the female with sticks gathered by the male. They are a bulky platform lined with grass, feathers and animal hair usually low in a dense bush or cactus. Three to five eggs are laid and incubated by both parents. The young are capable of catching prey on their own upon leaving the nest but the parents will bring food for up to a month. Roadrunners will eat just about anything they can catch. Their prey includes large insects, snakes, lizards and small birds. The author has observed them grab a bird by the leg, take it over to an adjacent rock, beat it to death and swallow it whole. They are also known to kill and eat rattlesnakes. They have also been observed to sit patiently below a hummingbird feeder and then leap into the air to grab a hovering hummingbird. 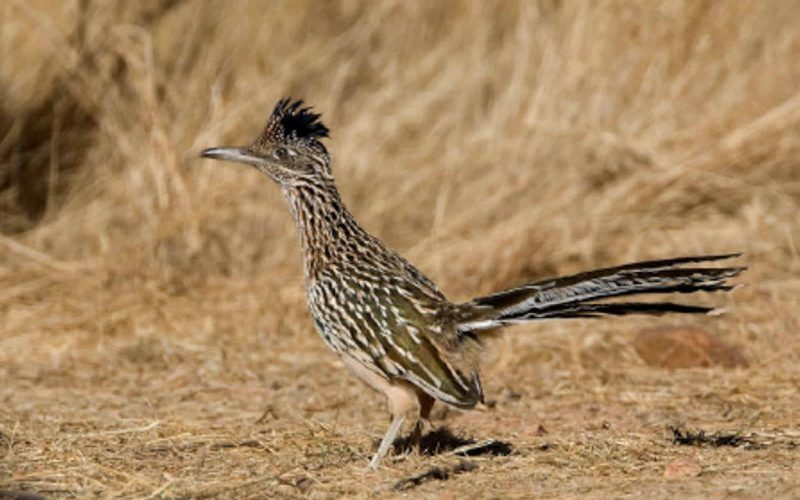 Roadrunners allow their body temperature to drop significantly at night. They enter a state of nocturnal hypothermia. This allows the roadrunner to save energy at night and results in lower food requirements during the day. Shortly after dawn the Roadrunner will turn its backside toward the sun. The wings are drooped and the large feathers on its back are erected, exposing black skin and small black feathers on its back. The roadrunner basks in the sun for many minutes to raise its body temperature. Roadrunners are present in Sabino Canyon and have been seen on multiple occasions in the canyon. One of the best ways to locate a roadrunner is to listen for the unique sound they produce by clattering their mandibles together. More than once the author has seen one of them by the tram ticket booth running with a lizard in its beak.